As the summer solstice approaches and the days continue to get longer, it's time to start thinking about the outfits you will be wearing on repeat this summer. Your summer essentials arsenal should be stocked full of pieces you go to time and time again when you need an effortless, flattering outfit that will keep you cool under the summer sun. A floral wrap dress does just that. No matter if it's humid or super sunny, an airy floral wrap dress looks good with basically everything. It accentuates the waist, creating an ultra-flattering silhouette, it's adjustable, and it pairs well with heels, sneakers, sandals and flats. With so many possibilities to choose from, today we will focus on the details that make the floral wrap dress unique to summer seventeen. 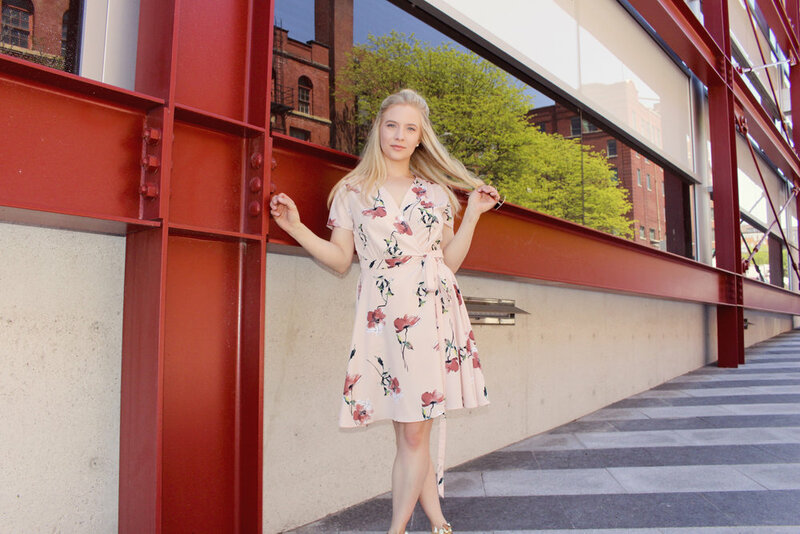 Read on for how to pick out the perfect summer floral wrap dress. Fabric choice can be the difference between sweating through your outfit and having a good time. For summer, you want breathable fabrics like linen, cotton and chambray (looks like denim). Also, stick to lighter colors like whites and pastels. These colors reflect heat from the sun and tend to show less moisture when you start to glimmer. Print is really up to your discretion and what reflects your personal style. This floral print glossary with photo examples helps you discover the type of floral prints available and their defining features. I would consider this floral print to be vintage. The colors are as soft and feminine as the dainty flowers. 2017 is definitely the year of the midi. A hemline once considered conservative, today, it is less modest and more modern. Any hem that falls below the knee or above the ankle is considered a midi. By making your legs and chest look longer, a midi hemline elongates your body and also creates the illusion of being taller. This proportion is key when selecting the right length. You want the midi to hit just above or below mid-calf where the calf is slimmest. At this length, a floral wrap dress in tight and straight silhouettes is a more sensual look. Adding a slit helps too. If you don't want as much length, a shorter midi is usually most flattering when it hits just below the knee. Find a dress silhouette with a voluminous skirt for a whimsical, romantic look you want to twirl in. A wrap tie closure is great for adjusting how the dress fits, yet, it's a total liability when unexpectedly coming untied. The secret to keeping a tie wrap dress snug and in place is securing the bow. This can be done a couple of different ways. First option is to double knot the bow. Next, try tying a double bow with a knot in between each bow. Lastly, tie your bow as your normally would and secure the knotted area to your dress. No outfit is complete without shoes and with the versatility of a floral wrap dress, you will have lots options to choose from. Look for shoes that don't have a ton of height above the ankle. Heels in any height as well as sneakers, sandals and flats work best. How high the heel and in what color is up to you. Looking for more information or have additional questions about styling floral wrap dresses? I would love to what questions you have! Leave me a comment below. Thank you for taking the time to read this post! I'm so grateful for your support. If you want to connect more, choose the social platform you like best.